Herbal ingredients have been used for thousands of years to aid recovery from a variety of health problems. Modern clinical trials are proving the science behind why these ingredients are so effective. The plants that we consider as herbs or spices, like garlic, rosemary or cayenne, have potent, naturally occurring plant chemicals called secondary metabolites. These biochemicals are used as signalling or communication molecules by plants. They are used for the plant's defense or they effect the hormones of nearby insects and animals. These plant chemicals have lots of different properties and there are tens of thousands of them… flavonoids, alkaloids, quinalones, various terpenes. They all have special, powerful properties that can kill pathogens, alter hormones, boost the immune system or stimulate tissue growth. 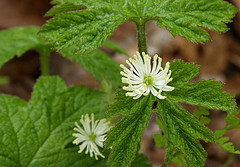 The Berberine in Goldenseal root can kill E coli, Staph, Strep and Psuedomonas bacteria. (Altern Med Rev. 2000 Apr;5(2):175-7. PMID: 10767672) There is a rational basis for use of this traditional plant compound for infections. 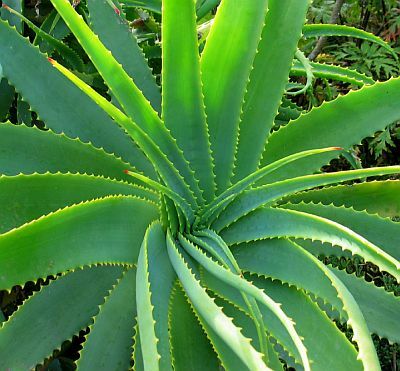 Acemannan, a derivative of aloe, is an immune system stimulant. Acemannan is known as an antiviral agent for several viruses as well as an interferon inducer. Mol Biother. 1991 Mar;3(1):41-5. 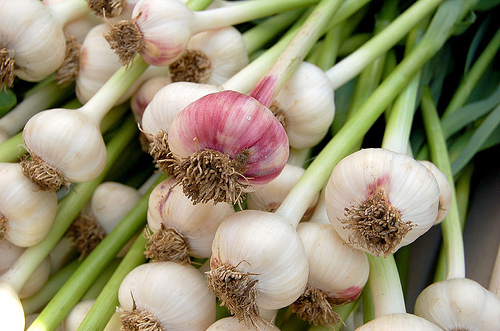 A recent article in the journal of the American Society for Microbiology entitled "Antimicrobial Agents and Chemotherapy" supports the notion that garlic is an excellent, although smelly, natural antimicrobial drug that can disable an unusually wide variety of infectious organisms. It does this by blocking two groups of bacterial enzymes, cysteine proteinases and alcohol dehydrogenases. There are thousands upon thousands of similar science references about the effective properties of plants in dealing to infections and healing animals and humans. Hawke’s Bay has a great growing climate ... aside from the wind. We also have some great soils. And we have water for irrigation. But most of us are coasting on our illusory laurels of food quality. Yes, we have variety thanks to our benign climate and long growing season. We have creative growers willing to plant new crops and do boutique processing. We’re getting the hang of food tourism with our food and wine biking trails and other food experiences. But are really capitalising on our advantages in order to truly and consistently produce the world’s most flavourful and nutrient-dense food? I say … not yet. When I say ‘nutrient-dense’, I mean food that is so chock full of minerals, vitamins and plant secondary metabolites (memorize those words, as they will eventually mean obscene profit and optimum health) that the flavour would entice even a picky three year old to inhale carrots and broccoli. Nutrient density only partly depends on genetics or the variety you chose to plant or eat. Heritage tomatoes are nice but even they, despite their nostalgic allure, can be woody and tasteless if they’re grown on soils that are deficient or unbalanced in minerals and bereft of an active soil microbiome. The building blocks (minerals) and the builders (microbes) have to be on the construction site (soil) and working in order to achieve a proper quality house (tomato) … a tomato that meets its full potential for antioxidants, storability and flavour. All of this adds up to nutrient density. When you get the agronomy right you end up with tomatoes that knock your socks off and orgasmic peaches. Now, honestly, are you really, consistently tasting that level of flavour year round here, even with the local produce you purchase? Are we actually growing our grapes, apples, plums differently than the rest of the world? The answer is pretty much, no. We use the same stock chemical fertiliser programs with minor adjustments. Yup, we’ve made advances with Integrated Pest Management but we still use toxic chemicals on our crops because we still have insect infestations, which are mostly caused by plant mineral imbalances from those old fashioned fertiliser programs – not because Mother Nature is mean to us. The sexiest thing in food production at the moment is nutraceuticals – concentrating or synthesising the nutrients in ag products to produce super health supplements. Why not just grow super nutrient dense, flavourful, natural food in the first place? Which would you rather eat – a nutraceutical bolus or a bunch of luscious cherries? Not necessarily. But agronomically, it’s pretty much impossible to get full flavour, high brix (a measure of natural sugar content), long-storing produce if you’re only using synthetic fertilisers and still spraying for insects and weeds. Why? Because the plants can’t access the broad spectrum of soil minerals needed for optimum photosynthesis, in part because the microbes that make those minerals available and protect the crop aren’t there. They’ve been nuked by the pesticides. We’ve been told the crop health and quality we produce and observe is fine. It’s all most of us have ever seen, so we assume it’s normal and the best we can do. It’s not normal and it’s certainly not optimal. It’s simply the accepted average, but is ‘average’ good enough for Hawkes Bay? Then watch as your soil humus content (darker soils) and nutrient density (brix reading) both rise over time. When humus and brix are increasing, the actual need for toxic pesticides declines. And when humus content increases, atmospheric carbon is being stored long term in the soil, which is climate change on the way to being solved, quickly and profitably. What’s not to love about this cutting-edge biological approach to agriculture? Unless you’re an ag chemical/ fertiliser or a pharmaceutical company. We now have available to us the science and tools to grow more produce, of better flavour, with fewer chemicals. Fruit, vegetables, meat, eggs and dairy that are brimming with complete goodness and that have food tourists flooding in to experience a low spray, soil-regenerating, sophisticated agriculture that generously rewards its practitioners and the consumers. Imagine having pristine aquifers without fear of pesticide contamination. Food without concern for chemical residues. Air without chemical contaminants. Children without birth defects and diminished cancer rates. These fearsome issues are all based in agriculture practices and in the way we eat. It’s all about nutrition and nutrition is all about the quality of the soil life. As a bonus, full nutrition begets flavour. It’s not possible to have world class flavours in produce grown on grey, lifeless soils deadened by chemical spray. First, because if it’s got poison on it it’s not pinnacle produce. Second, because those chemicals damage the soil microbes that are the critical to getting minerals into the plant to begin the biochemical cascade that results in flavours. Without the mineral nutrition properly mediated by microbes, the plants can’t meet their genetic potential for those secondary metabolites mentioned before. The natural secondary metabolite chemicals – like antioxidants, oils and terpenes – are the basis of the flavours that we prize. And their fulsome presence is part of the reason that high brix plants have fewer pest problems and also part of the reason organic growers can produce commercial crops without spraying. It’s a fallacy that we won’t be able to feed ourselves or the world if we don’t keep using the chemical tools at our disposal. Prestigious studies from the UN and others indicate that eco-agriculture can do a better, more equitable and more environmentally friendly job of feeding us than the current chemical paradigm for agriculture. For example, a recent University of Washington State study reviews 45 years of agronomic research and concludes that within a three-year period, on all the fronts – quantity, quality, and environment – organic/biological farming is superior. And you’re not required to grow a beard, wear jandals or forsake deodorant! This is all a multi win/win for us. We can have richer soils that hold more water, while reducing chemical use and contamination and producing more of a higher value, healthier product. Food and dining is a core social value of the high-end consumer we want to sell to, especially the Chinese consumers, who are some of the most educated and discerning when it comes to food quality. Recent surveys indicate they want organic and GMO free. And with hand-held food testing technologies around the corner, individual consumers will be able to know, in the supermarket, whether there are chemicals in their food and the actual nutritional values of the food they’re considering. We must prepare to consistently deliver on the quality we’re claiming. So whether you’re a gourmand or a mother of young children, you want to know more about how your food is being raised. Flavour is critical because it represents the inputs applied to the crop, the product integrity, and profit potential. Ultimately, it represents our health. Let’s grasp the challenge and produce in Hawke’s Bay the verifiably best food in the world.